Directions Do not take more than 6 doses in any 24-hour period. Age: adults and children 12 years and over, dose: 4 tsp every 4 hours. 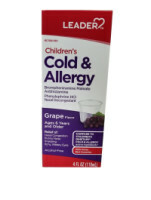 Age: children 6 to under 12 years, dose: 2 tsp every 4 hours. Age: children under 6 years, dose: do not use. Other Information: Store at 20-25 degrees C (68-77 degrees F). Uses Temporarily relieves nasal congestion due to the common cold, hay fever or other upper respiratory allergies. Temporarily relieves these symptoms due to hay fever (allergic rhinitis): runny nose. sneezing. itchy, watery eyes. Itching of the nose or throat. Temporarily restores freer breathing through the nose. For Ages 6 yrs & over. Alcohol-free. Warnings Do not use: to sedate a child or to make a child sleepy. If you are now taking a prescription monoamine oxidase inhibitor (MAOI) (certain drugs for depression, psychiatric or emotional conditions, or Parkinson's disease), or for 2 weeks after stopping the MAOI drug. If you do not know if your prescription drug contains an MAOI, ask a doctor or pharmacist before taking this product. Ask a doctor before use if you have: heart disease. High blood pressure. Thyroid disease. Diabetes. Trouble urinating due to an enlarged prostate gland. Glaucoma. A breathing problem such as emphysema or chronic bronchitis. Ask a doctor or pharmacist before use if you are taking sedatives or tranquilizers. When using this product: do not use more than directed. Drowsiness may occur. Avoid alcoholic beverages. Alcohol, sedatives and tranquilizers may increase drowsiness. Be careful when driving a motor vehicle or operating machinery. Excitability may occur, especially in children. Stop use and ask a doctor if: you get nervous, dizzy or sleepless. Symptoms do not get better within 7 days or are accompanied by fever. If pregnant or breast-feeding, ask a health professional before use. Keep out of reach of children. In case of overdose, get medical help or contact a Poison Control Center right away.